The animal body is like a machine in that it needs parts, catalysts and fuel if it is to function properly. These substances are called nutrients and most of them must be supplied by the diet.Vitamins belong to these vital nutritive substances. Some are essential for the transfer of energy while some are vital for the regulation of the protein, carbohydrate and fat metabolisms. Without vitamins, and minerals, the body is unable to break down the food substances and turn them into structural units and/or energy. Because animals can synthesize only a few vitamins and no minerals they must form a permanent part of the dietary intake. According to reports from veterinarians, however, up to 90% of the ailments they treat in birds are due to an incorrect and inadequate diet. In the majority of cases the cause is a deficiency in the active substances - vitamins, macro and trace elements, especially in times of stress when a bird's needs can fluctuate considerably.At times like these the supply of vitamins is often either insufficient or not available to the body in full, namely, a hypovitaminosis. 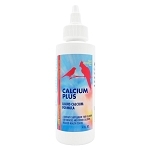 A hypovitaminosis is not easily recognized at first, but any long-term deficiency will lead to considerable damage to a bird's health and finally to its death.NEKTON-S provides birds owners with a food supplement especially formulated to suit these needs. Its well-balanced composition of 13 vitamins, 18 free amino acids in the natural L form and minerals will help prevent deficiency diseases and increase the nutritional value of the diet.NEKTON-S increases a bird's resistance to disease and the pressures of molt, shows, acclimation, etc., as well as improving its productivity, especially during breeding.Give daily to ensure your bird's good health. 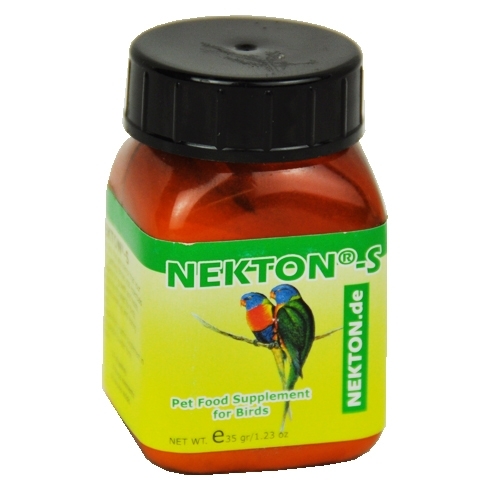 Simply add to soft food or bird's drinking water.Because of the all-round beneficial effect of NEKTON-S, aviculturists, bird parks and zoological gardens have chosen it as a daily supplement for their birds for years with success. Q: Is this product a powder or liquid? Does this product contain Vitamin A? A: Nekton S is a powdered vitamin, and yes it contains Vitamin A.